On this day of 1992 Team USA’s well-deserved induction into the Pro Basketball Hall of Fame, BallinEurope again takes the opportunity to remember those other two squads competing in the Barcelona Games whose impact on an international level was almost as great and whose impact at home was inestimable. What the Dream Team gave to the international game, aside from the showcasing of quite simply the best side ever assembled by a long shot,* was a new measuring stick for talent, a definition of what national basketball pictures should aspire to produce. In Croatia and Lithuania, however, the national teams in some senses had already won before the Olympic torch was lit. Both teams represented a regeneration of national programs, as both had contributed mightily to the greatest communist era teams ever: USSR and Yugoslavian national squads in 1988 – ultimately probably the peak year for “Iron Curtain” basketball – were populated with names like Marciulionis, Kurtinaitis and Sabonis, Petrovic, Radja and Kukoc. But 1992 changed all that. Yugoslavia as an entity had effectively dissolved with the crumbling communist power structures and by 1991, Croatia was at war with Serbia – a war which would divide the team both figuratively and literally. (Tolajian’s documentary on the Team Yugoslavia breakup is entitled “Jednom braća” or “Once Brothers.” Though confirmed as part of ESPN’s “30 for 30” documentary film series, the air date for “Jednom braća” maddeningly remains unscheduled thus far. 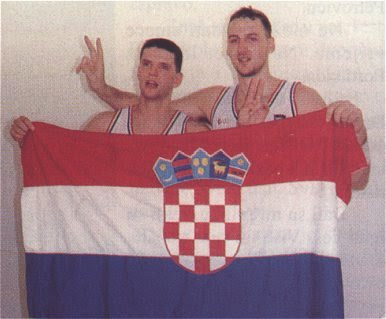 All nationalism and rhetoric aside, the formation of Team Croatia was a way for the “new” country (the European Union and United Nations chose to recognize Croatia as an independent nation on January 15, just six-and-a-half months before the commencement of the Olympics) to use basketball to carve out its very place on world maps. And carve they did. With a roster of Dražen Petrović, Toni Kukoč, Dino Radja, Žan Tabak, Velimir Perasović, Stojan Vranković, Arijan Komazec, Danko Cvjetičanin, Franjo Arapović, Aramis Naglić, Vladan Alanović, and Alan Gregov, Croatia – along with Lithuania and the “Unified Team” of loosely affiliated former Soviet republics – proved itself to be the class of the second class at these Olympics. BiE would dare say that the 1992 team remains Croatia’s finest to date, in fact. Those old guys like BiE who were around Back In The Day will easily recall the storylines of the two Croatia-USA meetings. Game one was Team USA’s second in the tournament after the feasting on of Angola for openers. This one of course was all about Michael Jordan and Scottie Pippen’s dissecting Kukoc, a Chicago Bulls draft pick who was rumored to be contending for impending free-agent Pippen’s job on the wing. The result was a 103-70 steamrolling by the Dreams as Toni went for four points and seven turnovers against stifling D.
Though we didn’t realize it at the time, the gold-medal game would also be the last time Petrovic would play in a championship game. This clip – one of BiE’s all-time favorite YouTubes – is definitely worth a rerun. History has forgotten what words were exchanged between His Airness and Drazen during the memorable one-on-one contests on the court, but BiE likes to imagine that, rather than trash-talking, some discussion on the game’s finer points is going down. Meanwhile, finishing third that season was Team Lithuania, playing as such in its first Olympics since 1936. Even before this team became fully assembled – we knew Sarunas Marciulionis and Arvydas Sabonis would be there, for sure – through an amazing fusion of pop cultural zeitgeist, Marciulionis managed to drum up financial support for the would-be Olympic Team by means of the Grateful Dead and two generations of San Francisco hippies. Today, we can look back on the campaign as genius in marketing and representative of NBA basketball’s brand new internationalism in the post-communist 1990s. Back then, it made for some bitchin’ tie dye shirts, clearly one of the dopest wardrobe items of ’92. The relationship between the ‘Dead and Team Lithuania would continue into the 1996 Games, even taking up countercultural Bay Area hoopsters Bill Walton and Chris Mullin along the way. But in 1992, the main thing was just for this basketball-mad culture to see their boys playing under their own colors, rather than those of an unwanted oppressor which would never properly acknowledge the contribution by the “republic” to Soviet sport. If the USA’s ’92 squad was a fantasy team, Lithuania’s first modern roster was a dream-come-true team, as will hopefully be captured in fittingly-named documentary “The Other Dream Team.” This film is scheduled for 2011 release, surely in parallel with the Eurobasket tournament hosted by Lithuania for a truly prescient reminder of how far this national program has come. The 1992 edition of Team Lithuania included Arvydas Sabonis, Šarunas Marčiulionis, Valdemaras Chomičius, Rimas Kurtinaitis, Sergėjus Jovaiša, Artūras Karnišovas, Gintaras Einikis, Arūnas Visockas, Darius Dimavičius, Romanas Brazdauskis, Gintaras Krapikas, and Alvydas Pazdrazdis. In conclusion, may BallinEurope again wish 1992 Team USA congratulations on their reception of this great honor. And though Dream Team Croatia and Dream Team Lithuania might never receive official accolades in Springfield, they can rest assured that they will always hold a special place in the hearts and minds of those who were lucky enough to have seen them play in the time of The Greatest Team Ever. * The only two teams in BiE’s opinion who can even enter the discussion, i.e. who *might* possibly give the Dream Team a series: Dream Team III, with much of Dream Team I plus Hakeem Olajuwon and Shaquille O’Neal, who probably should have been on the roster in lieu of the more politically-correctly chosen Christian Laettner in ’92; and the Redeem Team of 2008, Generation Y’s own Dream Team. can you imagine if Yugoslavia and USSR were still united what super teams they’d make in basketball? I’m Lithuanian and I prefer not to image USSR united again. NEVER. You you want to image super power in basket ball image EU having it’s team. @ Shilas: Actually, that would be brilliant — i’ve proposed that idea to friends before. I mean, all the Greeks, Spaniards, Lithuanians, Croatians, and French (and more) to draw from? Whoa.